In between those two symbols is the United States of America. Our national immigration policy is a mess, and with the House refusing (yet again) to take meaningful action, let’s take a look at what that costs us here in Utah. The stonewalling on immigration exemplifies the political dysfunction and grandstanding in Washington that is tying our government up in knots. In June 2013, the U.S. Senate passed SB 744, the Border Security, Economic Opportunity, and Immigration Modernization Act, a comprehensive bill reforming the immigration system. The bill passed 68 to 32 with Sen. Hatch supporting it and Sen. Lee opposed. While the bill has good and bad points (it’s a compromise! ), it is a step in the right direction. But, while the Senate acted, the House dithered. I repeat: the House dithered. The Utah Compact, signed in November 2010, established Utah as an immigration leader and should serve as a national model. Most undocumented workers are hard workers who contribute to our economy. They are here for the most noble of reasons: to seek a better quality of life for their families. Their path to residence and citizenship should be simple, straightforward and direct. It is time to bring undocumented workers and immigrants out of the shadows, and offer an opportunity to obtain legal status, even citizenship, if they are willing to pursue it. 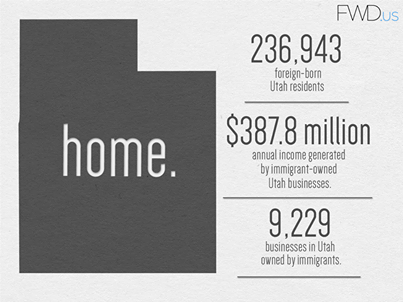 The largest immigrant groups in Utah are from Canada, El Salvador, and Mexico. According to a recent study by the University of Utah, Mexican immigrants, alone, have more than $1 billion in purchasing power and pay millions in taxes to the state. Immigrant students in Utah also contribute to critical Science, Technology, Engineering, and Math, or STEM fields. In 2009, 29 percent of the students earning Master’s or PhDs in STEM fields from the state’s research-intensive universities were temporary residents. For a state like Utah, fixing our immigration system so that it is easier for students trained in America to remain in the country after graduation is critical. And, expanding the number of high-skilled (H-1B) visas will also have positive economic effects. Regional Economic Models, Inc (REMI), estimates that expansion of the H-1B program would result in more than 1,400 jobs and add more than $117 million to Gross State Product by 2014. In other words, now. And as for that “trickle down effect,” let’s talk about basic jobs that don’t require advanced degrees. Reforming our immigration system will generate millions of dollars and thousands of jobs across Utah (and by extension the nation). According to REMI, undocumented immigrants who enroll in a legal path to citizenship will generate more than 6,100 jobs and more than $475 million for the state by 2020. I leave you with this final thought: so far the border fence designed to keep people out has cost American taxpayers $1.2 billion to build and maintenance costs for the life of the fence are estimated at $50 billion. The Statue of Liberty, the symbol of welcoming immigrants, generates about $174 million a year in revenue.